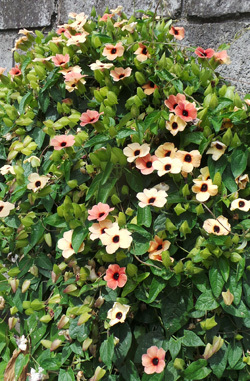 Thunbergia alata is a fast-growing, free-flowering vine. Black-eyed Susan vine is commonly grown in the Midwest as a season annual to provide color in a vertical setting. 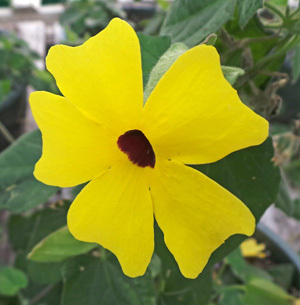 This plant, Thunbergia alata, is actually a tender evergreen perennial in the acanthus family (Acanthaceae) native from tropical East Africa to eastern South Africa that is hardy only in zone 9 and 10 (and is completely unrelated to Rudbeckia hirta, an herbaceous annual or short-lived perennial in the daisy family (Compositae) native to north America also commonly called black-eyed Susan). But because it grows and flowers relatively quickly it is often used as an annual ornamental garden plant in cooler areas. It should be used with caution in frost-free areas as it has become invasive in many warm locations throughout the world. 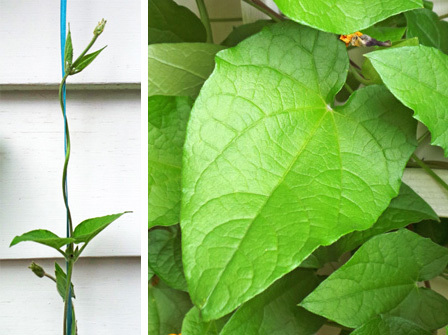 This vine grows by twisting around supports (L) and has heart-shaped, softly hairy leaves (R). Midwest (and much more in frost free climates). The plant is a rambler, climbing by twining (growing in a spiral up a support) rather than by clinging or producing tendrils as some other vines do. The opposite, oval to triangular or heart-shaped leaves grow up to 3 inches long on winged petioles. They are soft and hairy, dull dark green on the upper surface and pale green with prominent veins below, with slightly toothed margins. Showy flowers in shades of orange and yellow are produced singly in the leaf axils. Each 1½ inch wide flower emerges from a small yellow-green calyx enclosed in 2 large, ridged, hairy, green bracts. The trumpet-shaped corolla opens flat with five overlapping petals surrounding the brownish-maroon center. Showy flowers (RC, from side and R from front) emerge (LC) from hairy bracts (L). Pollinated flowers develop a fruit (LC) enclosed in the green bracts (L), which ripens and dries (RC) to a tan color. Plants bloom from mid-summer to frost, often with the best display in late summer. The species typically has brilliant orange flowers, but there are cultivars in pastels and white as well. Butterflies, bees and hummingbirds will visit the flowers. Each fruit releases a number of reticulate seeds. Seeds are often produced late in the season. The fruit resembles a bird’s head with a round base and a long ‘beak’. 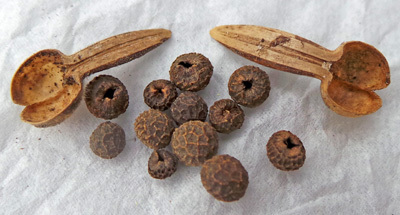 Each fruit contains 2 or 4 semicircular, reticulate seeds. 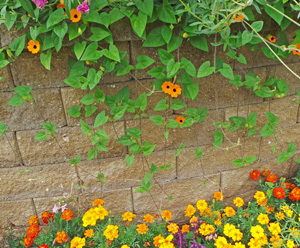 Black-eyed Susan vine will quickly cover small structures. 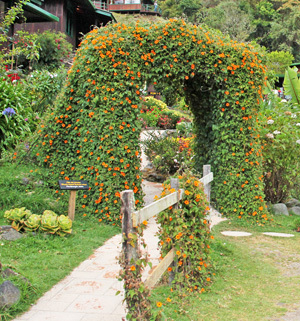 This vine will cascade down walls or from hanging baskets in addition to climbing. cascade from a hanging basket (as well as grow up the hangers). 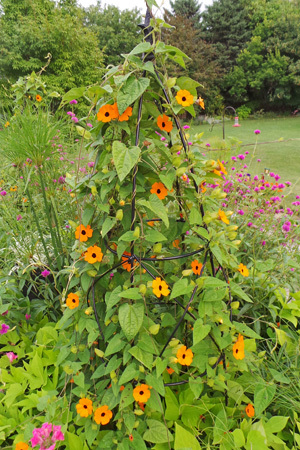 Try combining black-eyed Susan vine with other aggressive vines such as morning glory or purple hyacinth bean. The orange or yellow flowers would contrast nicely with purple or blue flowers, such as salvia or ageratum, or purple-foliaged plants (such as Persian shield or purple heart) planted adjacent to the vine’s trellis. Use hot-colored flowers such as tall red zinnias, orange marigolds, or bright yellow celosia for a completely different look. Cultivars offer different colors than orange. Or combine them with bright red cannas and large elephant ears for a tropical look. 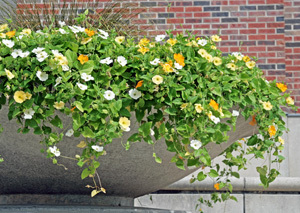 White, orange and yellow Thunbergia alata in a large container. 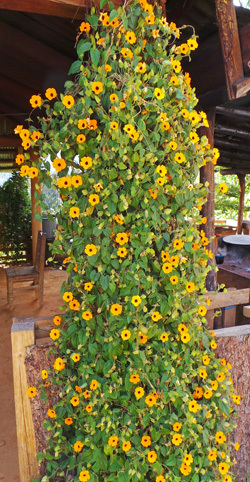 This vine can be used in a large container with a small trellis, and can be grown as an indoor plant (although it will likely need to be trained and pruned to keep it at a manageable size). 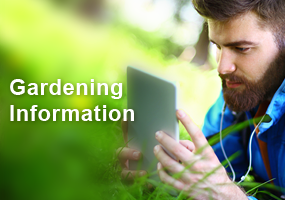 Plants in containers will bloom over winter if kept in a sunny place and night temperatures are above 60 degrees. In frost-free climates this vine is perennial and will grow very dense. The vine will quickly fill narrow vertical spaces with color. Thunbergia alata grows best in rich, moist soil in full sun. It tolerates partial shade but flowering may be reduced. Seed can be sown directly where the plants are to be grown once soil temperature reaches 60F in the spring, but transplants give better results in the short growing season of the upper Midwest. Plant near the trellis, fence, or other support structure, 14-16” apart. Fertilize every 2 to 3 weeks when in bloom if grown in containers. Outdoors blackeyed Susan vine has few pest problems, but if grown indoors it is readily infested by spider mites and whiteflies. 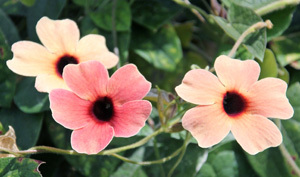 Black-eyed Susan vine is most often propagated from seed. This plant is most commonly propagated from seed (although softwood cuttings can be taken or stems layered, too, but plants grown from seed tend to be more vigorous). 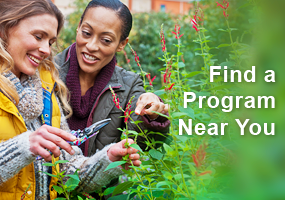 Start seeds indoors 6 to 8 weeks before the average last frost, and plant outside once all danger of frost has passed and night temperatures remain above 50F. Soaking the seeds in warm water overnight before sowing will speed germination. Press the seeds into the soil, covering completely. Seeds should germinate in 10-21 days. Plants grown in containers can be overwintered indoors in a warm, very bright room. There are many different.cultivars available. Hi! I have 2 black eyed Susan vines and want to bring them in for the winter. How much do I cut back to overwintering? And will they come back? A lot of my vines broke off trying to untangle them to bring in. Will they come back? I got a Raspberry Smoothie thunbergia this spring to grow in one of the village flower beds. It has overtaken the bicycle that I ‘planted’ it neara and is the focal point of the garden. I will collect seeds in hopes that I can get several plants for the other gardens. I bought my first Blackeyed Susan Vine at the farmers market in May. I feel in love with the flower and had to have it. It has now outgrown the first two trellis I have bout, it now stands at about 8 feet tall and does not seem to be stopping. It is absolutely beautiful, but my husband and I don’t know quit what to do with it. We live in an apartment and it is planted in a flower box. I would also like to know when I should winterize it and how to winterize it. I would also like to know if there is a way to tame or slow it down? We live in Portland Oregon. I am working on a project and I need to know – how deep should the pot be at the minimum? And do the have a big root system or a small root system? Can anyone tell me how to take softwood cuttings from the plant to grow more? I’m not too sure on what softwood would be considered. Ok just bought my first two black eyed Susan’s. I live in Florida. Can someone tell me how to collect seeds from my own plants. I adore this plant? They are growing in hanging baskets. Now I am trying to figure out how to put them into a larger container. Any suggestions? There is certainly a ripple effect that happens and it will spread to other neighbors. It’s not hard to inspire others and this is a great way. Thank you for such a good post. I am looking for the Pink Thunbergia Seed. I can’t seem to find it anywhere. I’ve researched on the and have contacted some seed company’s. Does anyone know where to order Thumbergia ‘Raspberry Smoothie’ or know of a pink variety? Thank you. This year I purchased the first “pink/mauve” Thunbergia plant from the Vite Nursery in Niles, Michigan. great online website. Hope you look into it. I did not realize that this vine can become invasive in many warm locations throughout the world. I usually use this vine in my gardens and grow on a 5 foot free standing trellis. I have only seen the yellow and orange cultivars. I would love to find some of the others. My thunbergias are blooming less than in years past although planted in the same spots. I use new dirt in the containers each year, slow release fertilizer and some composted manure. Any ideas on what fertilizer combination I might try to boost the blooming? 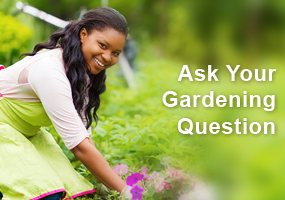 Are you purchasing new plants each year or using seeds from existing plant? 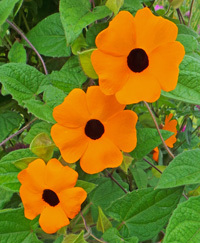 I grow thunbergia – mostly orange with dark eye, at my home in NC and at my summer home in Maine. I have been growing them for over 10 years I feel the plants I purchased in 2006 were more Hardy and showy(more blooms). I collect seeds each fall as well as purchase /grow the newer colors. In the spring, once plants are established, filling out, 18″ vines, I fertilize all flower bearing plants with bloom booster 9-59-8. IMO the recent plants are less showy and smaller at season end than they used to be. However, the plants I grew from seeds I collected seem to be more hardy and showy. The original yellow w/black eye and orange w/black eye produce far more seed pod than the newer colors(orange a-peel, Arizona/African sunsets, super star.) I have nothing to back up this theory except personal experience. Like you, I plant thunbergia in same locations each year as well as additional plants in new locations in my yards. love these and want to start my own…some of all varieties and colors. Where can I purchase seeds?